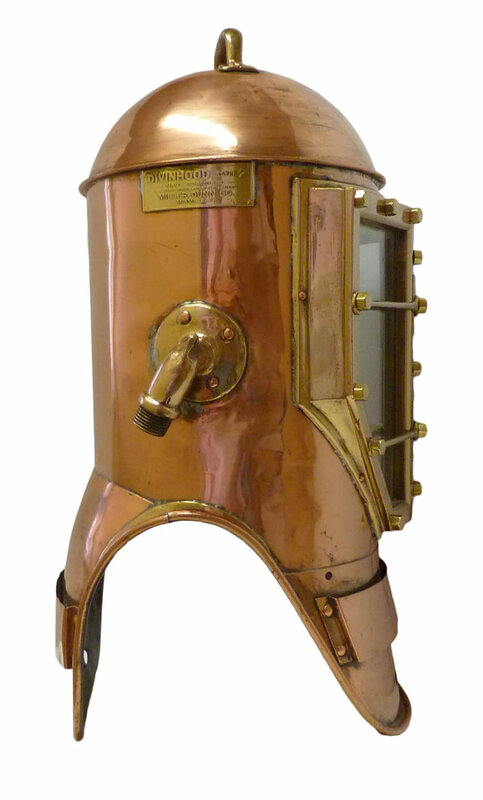 To view our current inventory of quality vintage diving helmets and dive gear, click here! Dimensions of Helmet:H22 1/2” x W11 1/2"
Copyright 2018 by Land And Sea Collection.com, All Rights Reserved. 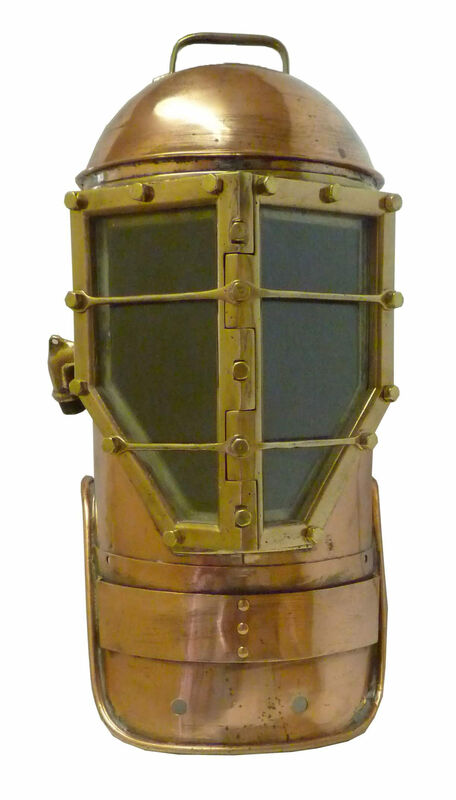 Presented is a shallow water Miller-Dunn Navy Style 2 Divinhood as was used by the U.S. Navy from about 1929 until the adoption of the ubiquitous Style 3 in the early 1940's. It is complete in all respects except for the weights and is in excellent condition. This design and the Style 1 are the most unique of this maker's helmets, and the Style 2 is the most dramatic looking, making it very sought after by collectors. 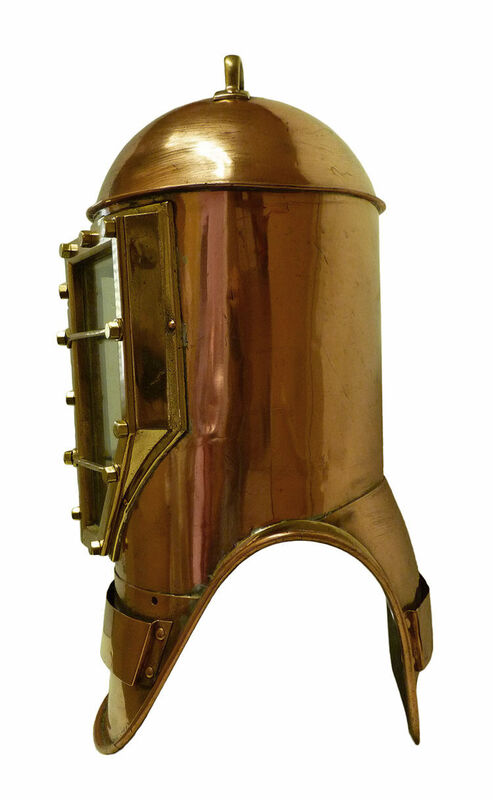 The helmet has been in a private collection for some time, and is new to the market. It has been polished, adding to its dramatic presentation, and some repair work done. Note the extended shoulders on this example. The early ones were made without them and were uncomfortable in use and therefore not as desirable. It is complete in all respects and in the same configuration delivered to the Navy. CONDITION: This helmet is in excellent condition with minor dings showing use. It has been polished making it a particular dramatic display. This helmet is for display only, and should not be dived unless certified by a competent diving shop. OUR UNCONDITIONAL NO NONSENSE GUARANTEE: If not completely satisfied with your purchase it may be returned within five days of receipt in its original packaging if without damage. Return items must be insured for their full value. Only a prior email authorization from us for the return is required. Shipping charges are included in this offer within the continental United States if an error is due to our fault. International buyers welcome, but inquire first. STANDARD FORMS OF PAYMENT are Bank wire transfer, cashier's check, money order, or personal check in which case the item will be held until cleared. Our prices are quoted net to us so that the use of credit cards or PayPal incur extra charges. Terms on overseas sales are different.